We do not live our own desires. Pressing ourselves into heavy molds not made for our bodies compresses us, tears our skin, and bruises our features. It is hard to breathe. We sink. Weight harbors the downward pull. It attaches itself in many ways but there are countless ways to set it down, to be free. This takes practice and skill. The common task of this class is to distinguish ourselves from the weight we carry. We shall seek out activities that contact levity: that gravity that changes our bodies, make us light of touch, aerates and propels us toward the state of buoyancy. 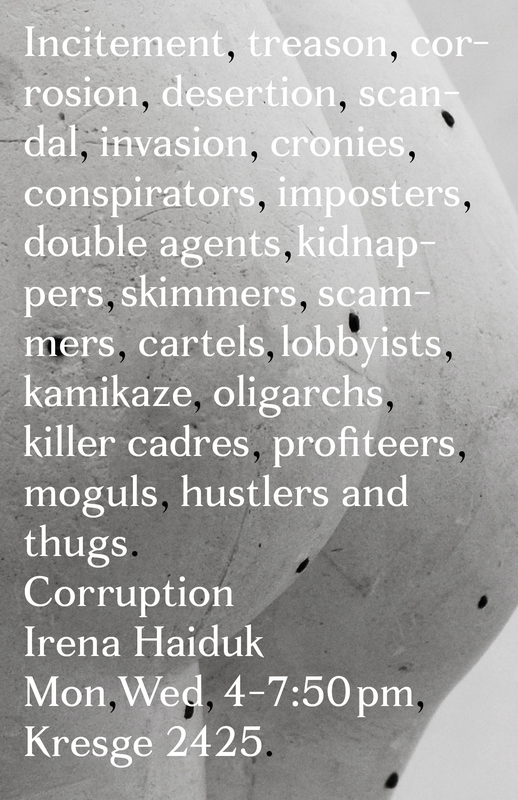 Corruption, seminar poster, Winter 2016, Northwestern University. This class promotes corruption as an art strategy and examines its official veneers and unofficial rules. Corruption is the gravitational pull that keeps markets, like atmospheres, bound to the center of the earth. *Note that the assesment format of this seminar is conversation, debate and oral defense. Written sumaries, tests and presentations are substituted with collective making and organizing assignments. 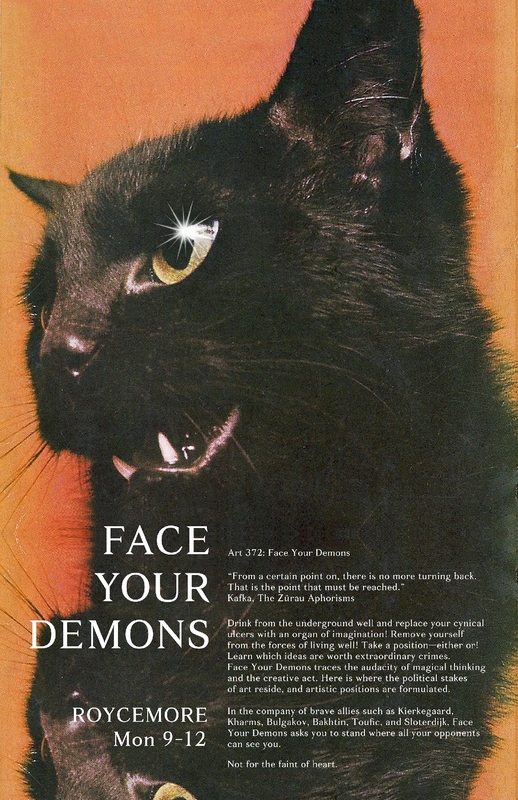 Face Your Demons, seminar poster, Fall 2014, Northwestern University. "From a certain point on, there is no more turning back. That is the point that must be reached." Drink from the underground well! Heal your cynical ulcers with an organ of imagination! Dismiss yourself from the forces of living well! Take a position: either or! Learn which ideas are worth extraordinary crimes. Face Your Demons traces the audacity of magical thinking and the creative act. Here is where the political stakes of living reside, and artistic positions are formulated. In the company of brave allies such as Kierkegaard, Kharms, Bulgakov, Bakhtin, Toufic, and Sloterdijk, Face Your Demons asks you to stand where all your opponents can see you. 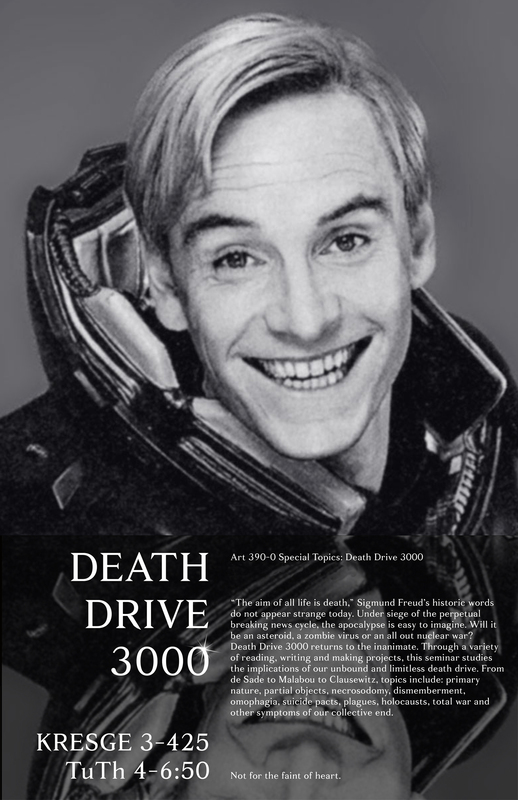 Death Drive 3000, seminar poster, Spring 2014, Northwestern University. "The aim of all life is death," Sigmund Freud's historic words do not appear strange today. Under siege of the perpetual breaking news cycle, the apocalypse is easy to imagine. Will it be an asteroid, a zombie virus or an all out nuclear war? Death Drive 3000 returns to the inanimate. 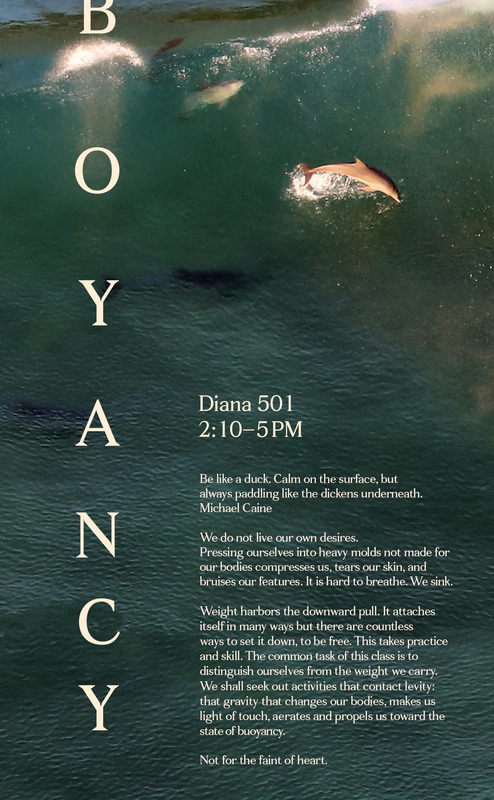 Through a variety of reading, writing and making projects, this seminar studies the implications of our unbound and limitless death drive. From de Sade to Malabou to Clausewitz, topics include: primary nature, partial objects, necrosodomy, dismemberment, omophagia, suicide pacts, plagues, holocausts, total war and other symptoms of our collective end. Not for the faint of heart.